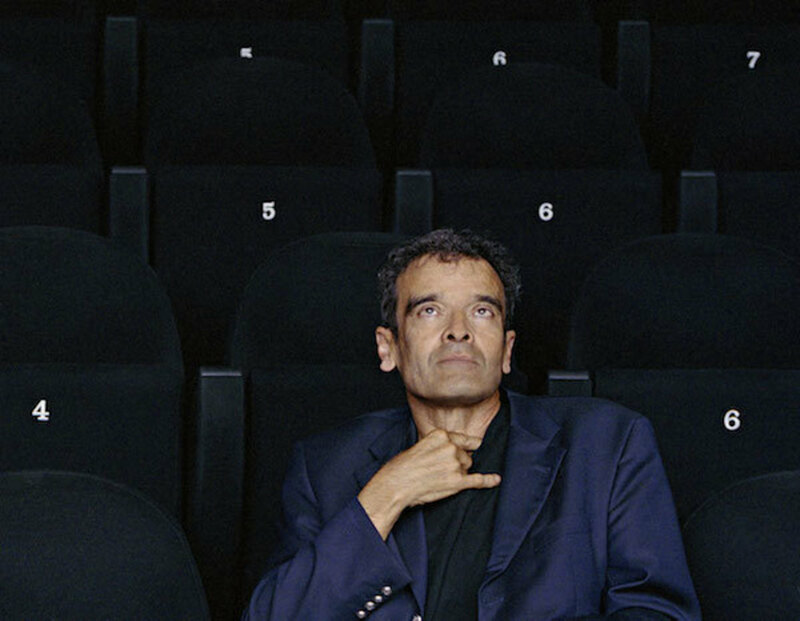 Harun Farocki, 2007. Photo: Hertha Hurnaus﻿. Two sentences. Two extraordinary diagnoses. Two critical warnings about a future that has already come to pass. The first is an imperative but also an observation about the relationship between seeing and contemporary warfare. The second is a premonition about the fate of humans in an age of autonomous machine warfare. In the first sentence, Farocki asks us to “imagine” rather than to “see” this war. The distinction is crucial. Its implication is that the war he’s trying to describe is unseeable and undocumentable and that Farocki’s efforts to provide a glimpse into the world of autonomous machine warfare are insufficient. The artist seems to be saying that the film is little more than a series of images that is only useful insofar as it creates the conditions for an audience to “imagine” what the actual subject of his documentary might be. Farocki’s point is different than the standard critical analyses of documentary practice: that images never fully represent their object or referents, that images are always only ever fragmentary, open to interpretation, mystification, and the like. Instead, Farocki is pointing out that we’re at a historical moment when the operations of autonomous warfare are actually invisible, not because of the inevitable fetishization and mystification of images in general, but because wars are being waged through systems that are simply postvisual, or more accurately, systems whose imaging capacities exceed those of human eyes to the point of being invisible to them. A quick survey of the twenty-first century’s paradigmatic weapons bears this out: from Stuxnet sabotage software to FOXACID espionage servers and from the PRISM and TEMPORA mass-surveillance programs to the drone attacks triggered by various metadata “signatures,” the weapons of the present-future are decidedly postvisual. Roads and trenches are replaced by server pings on a network, crosshairs are replaced by algorithmic metadata analysis, and “the whites of an enemy’s eyes” are replaced by their electromagnetic signature. Farocki asks us to “imagine” the war of machines, not because that war of autonomous machines isn’t taking place, but because we can only attempt to “see” it though our own imagination. It is literally invisible. But the second sentence in Farocki’s formulation, the last in the film, is perhaps an even more poignant warning: “Wars without soldiers like factories without workers.” It’s a specific and deliberate Marxian analogy, and indeed, Farocki was deeply indebted to Marxist theory: His consistent methodology of bringing a camera to sites of image creation and spectacle strongly echoes Marx’s own materialist methodology of examining spaces and relations of production to understand capitalism and society. For Marx, the factory was the foundational site of capital, the predominant one through which the capitalist class extracts surplus value through the exploitation of workers. But there was more to Marx’s formulation—the factory, like nearly every other corner of the capitalist system, was rife with contradictions. In the Marxian schema, the worker is ultimately the source of all surplus value, a fact that imbues the working class with a unique historical agency. Despite its exploitation, or more accurately because of its exploitation in the factories, the working class is in the position to overthrow capitalism itself. So what does Farocki mean by the idea of “factories without workers”? On one hand, Farocki describes a world in which automated weapons and targeting systems have come to dominate the operational aspects of warfare—autonomous machines making decisions for themselves about what will be targeted and what will not and who will live and who will die (signature drone strikes, automated cyber weapons). But there’s a deeper implication to the factory without workers, which is a world in which humans no longer have any agency, a world in which humans could not stop the war even if they wanted to. A total war that bootstraps itself, a self-sustaining process that continues without any external input. When I remember Farocki, I remember a great artist who more than just about anyone taught me to “see” the historical moment in which we’re living. An important part of that lesson was his warning about the things that we can’t see but under whose influence we nonetheless increasingly find ourselves. Trevor Paglen is an artist and geographer based in New York. See the February print issue of Artforum for more on Harun Farocki.